This is an excerpt from my research into high medieval English pastry. For more information and a full bibliography, see “Raising a Coffin” and “Crustardes of Flessh” on the Files page. The most abundant grain in these samples was bread wheat, although this study does not specify any specific recognizable varieties of bread wheat or characteristics such as grain color, etc. One significant difference between modern wheat crops and the evidence from roof thatching is the presence of rivet wheat among the medieval samples. Although rivet wheat is no longer grown commercially on any significant scale, 60% of the roof samples contained at least some rivet wheat. (ibid) Rivet wheat tends to produce high quality thatching straw, so it is possible that it was of greater importance historically for this reason. As many of the roof samples are composed of threshed straw and threshing waste, it is reasonable to conclude that these samples accurately reflect food crops. Modern wheat (and other cereal grains) are grown as monocultures, vastly different from the diversity of medieval fields. The stark reality is modern wheat bears very little resemblance to its medieval ancestors (for discussion of genetic changes in wheat over time, see Haudry et al and Peleg et al in sources). The number of wheat varieties grown in the UK has dropped precipitously since World War II (Ambrose and Letch): in the 1830s, some 150 named wheat landrace varieties were described, and in the 1920s and -30s 63 wheats from across the UK were collected, classified, and catalogued. But by 2003, only three landraces were recorded (specifically as being grown for thatching). (ibid) Typically early landraces referenced place names, and it is highly likely that each region in England had a unique wheat variety historically. 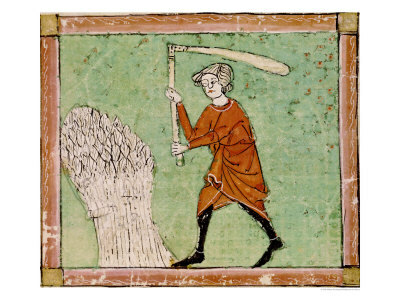 Although medieval records differentiate between types of crops (e.g. wheat vs. rye), they do not differentiate between varieties within a crop. For example, wheat is universally referred to as frumentum in manorial records of the period (Stone). 16th century written accounts differentiate between different varieties of wheat, but I have found little evidence as to when these varieties appeared or whether medieval people used different wheat varieties for different purposes. Generally the evidence suggests that any single field would contain a mixture of genetically distinct wheat plants and different areas would have their own unique wheat variety, so it is unlikely that the universal term implies that wheat was a homogeneous crop. The lack of distinction between different wheat varieties could suggest that people simply used whatever wheat was available to them for any given purpose rather than using individual varieties purposefully. This lack of information about medieval wheat varieties is frustrating for the modern cook, as different varieties of wheat have vastly different properties. Since wheat would have been the flour used for pies prepared in high status contexts, I felt I needed to find additional information about the qualities of medieval wheat flour. The major distinction between modern wheat varieties is between hard red and soft white wheat. Hard red wheat is higher in gluten and preferred for bread baking, while soft white wheat is higher in starch and is preferred for, among other things, pie crusts. Even when late medieval or post-medieval texts describe particular varieties of different cereal crops, it is essentially impossible to correlate these characteristics with modern varieties (Moffet). Other written sources do not provide any more clarity. In his translation of Galen’s On the Properties of Foodstuffs, Powell notes that the different varieties of wheat known to Galen were einkorn, emmer, durum, and bread wheat, but does not distinguish between different varieties of bread wheat (T. aestivum). By the very end of the 16th century, John Gerarde in his Herball mentions white wheat, red wheat, and flat wheat by name; from the description and its accompanying picture flat wheat may refer to rivet wheat. It is not clear if the white and red wheat of Gerarde correspond to the varieties of the same names of today, or if they do when these varieties appeared. *No USDA data available. Data given are from http://www.einkorn.com/wp-content/…/Grain-Nutrition-Comparison-Matrix.pdf. ***Total, so includes both gluten and other proteins. It is interesting to note that all of the “ancient” wheat varieties (as they are grown today; these are not living fossils, but modern crops that have certainly undergone evolutionary changes from their ancestral forms) contain a greater amount of protein even than modern hard red wheat. However, the gluten content in historical grains is said to be lower than the gluten content in modern wheat, as breeding wheat to contain more gluten (for better bread baking) has been a major aim of industrialized agriculture. Spelt in particular is generally considered poor for bread baking by modern bakers. This suggests to me that medieval bread wheat would have tended to have less gluten than modern hard bread wheat. I was unable to find macronutrient data on rivet wheat (T. turgidum), but I did find a reference to it being “better suited to biscuit- than to bread-baking” (Hamerow et al) which suggests a relatively low gluten to starch ratio. Very interesting read! Using roof thatch for evaluating cultivated species in medieval England is genius. I’ve heard of collecting mud cores for sampling pollen or carving a bit of wood from furniture for age and growth ring analysis, but roof thatch is a new one. Thank you for this article.